Traditional Chinese Medicine (TCM), the ancient yet Modern approach to treating the whole person with acupuncture, herbal medicine, nutrition and bodywork, is about 5,000 years old. It is a system of internal medicine that uses tongue and pulse diagnosis, along with attentive listening and looking at the person, to address a wide range of issues including but not limited to pain, stress, depression, anxiety, digestive problems, infertility, general health and longevity. The Ancient Chinese considered food and herbs to be medicine; Modern Nutrition that is inspired by Traditional Chinese Medicine uses food and herbs to nourish Qi and Blood. It looks at the effect a particular food has on the body, rather than how many grams of iron it contains in a laboratory; does it warm us up or cool us down? Does it move Qi or help us make more yin or yang? Raw lettuce eaten by one individual in the summer might make her feel energetic, yet when eaten in February, it might make her bloated, tired, and gassy. The average American today is deficient in Qi (a.k.a. energy or Life Force), which can show up as fatigue, depression, sluggish digestion, bloating, and loose stools, among other things. Many Americans are also deficient in Blood (they may be anemic, pale, prone to irregular periods, light-headedness, insomnia, have difficulty concentrating or poor memory), as is anyone who has lost blood via menstruation, childbirth, or trauma. The good thing is that we can make more Qi and Blood by eating the right foods, herbs, doing regular exercise, getting acupuncture, and reducing stress. In Winter, we should eat warming foods such as organic grass-fed beef, bison, lamb and chicken, sweet potatoes, dark leafy green vegetables, barley and brown rice. We should avoid cold and raw foods. In the Summer, it’s best to eat more cooling foods, including brightly colored fresh fruits and vegetables, whole grains, beans, and fish. I like to think that the best medicine is located within us; we are all our own greatest healers. We are what we eat, of course, and the importance of eating locally grown, seasonal and organic food is even more important in this day and age of genetically modified foods and packaged everything. In my opinion, there’s nothing more healing than cooking a meal with ingredients I bought at the Pasadena farmer’s market (while wearing my 6-month-old in a sling and pushing my 2-and-a-half-year-old in a jogging stroller), washing the veggies with help from the kids, chopping them mindfully, picking a few herbs from the garden, and putting everything together into a yummy winter stew. (Find your own SoCal farmer’s market here). The slow-cooker (a.k.a Crock Pot), while a modern invention, is quite suited to Chinese Nutrition (not to mention the Slow Food Movement) because it heats food at low temperatures (180-280 degrees) over a long period of time (6-9 hours). It’s incredibly useful for those of us who are big on good intentions but short on time; we want to prepare healthy and delicious meals for our families but are overwhelmed by the demands of work and family. A good 6-quart slow-cooker is a busy parent’s best friend. You can get a nice one at Williams-Sonoma or Sur La Table, or a perfectly good one (perhaps from the 1970’s) at a yard sale. Here, I share with you a recipe I’ve developed for the slow-cooker; it is just as good cooked in my favorite stoneware Dutch oven, but that involves more preparation and oven-watching time (which can be nice and meditative, if there’s extra hands around my house to keep an eye on the kids). The great thing about this slow-cooker version is you can prep it in the morning, turn on the slow-cooker, completely forget about it, and dinner will be ready 8 hours later. Slow Food for a Fast-Paced Life. 1. Coat slow-cooker with olive oil, using a cloth napkin to distribute it around the stoneware insert. 2. Saute onions and celery in a pan until translucent. Add garlic and a pinch of sea salt. Cook another 5 minutes. Remove from heat. 3. In a bowl, combine flour, salt and pepper. 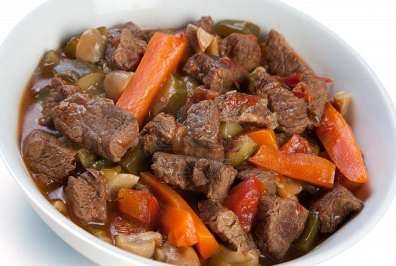 Toss the beef in the mixture, shaking off excess flour, and place on a plate. 4. In a large skillet, heat the olive oil over medium-high heat. Brown the meat in batches, gently stirring, making sure all sides get browned. Add more olive oil to the skillet when necessary. 5. Place the potatoes, carrots, parsnips and celery on the bottom of the slow-cooker. 6. Place the browned meat on a plate covered with a muslin cloth or paper towel, blotting up excess oil, and then transfer the meat to the slow-cooker. 7. Add the onion, celery and garlic mixture to the slow-cooker, stirring gently to make sure they are distributed throughout the dish. 8. In a bowl, mix together the red wine, beef broth, cumin, and pinch of salt. Pour into the slow-cooker. Add the bay leaf. 10. Discard the bay leaf. Stir in the parsley, and serve the stew over brown rice. I do believe this stew is best the next day.